food pYramid!!!!!!!!!!!!!!!! THE L WAY!!. . HD Wallpaper and background images in the Death Note club tagged: l note light ryuga death note l de misa shinigami frit strawbery. lolz yeah totally then ppl would actualy pay attintion to it!!!! i have been eatin that stuff the same way as L sinc ei was 5, but insted of normal food at the top it is blood and normal food, YAY L AN BB!! HUZAAA!! Boo the old food pyramid!!!!! Go L's!!!!! If you find any mistakes, do not kill me. I am Brazilian. 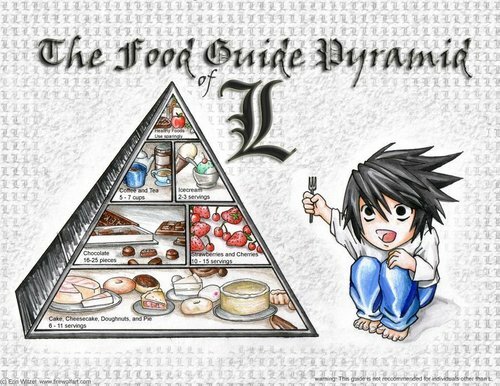 :D L's food pyramid! Huzzah! Since when did L steal my food pyrimid? Wonderful indeed. I love all of it. this is so funny...he is luking cute!! !